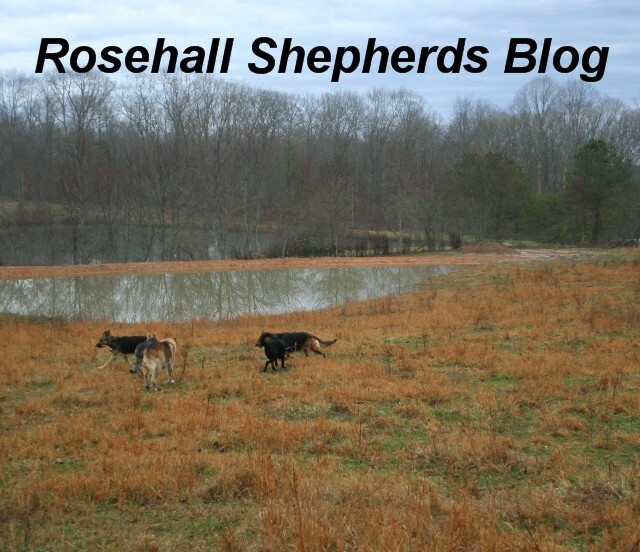 The Rosehall Shepherds blog: Importance of socializing your puppy. Importance of socializing your puppy. Hello everyone thank you for stopping by! I apologize for it being so long to write a blog but as you know I have been very busy! I have actually started school full time again so please bare with me! I hope you all had an amazing and safe Holiday! As you know I have been working with Emery with her basic obedience and working on training her to be my service dog as well! I would like to start by saying she has been doing amazingly well for a now 4 month old puppy! She can sit, stay, lay down, come (on command), heel, and walk nicely on a leash! I have also been socializing her at the dog park with other dogs and people! First, socializing Emery is one of the most important things I can do for her! The reason why it so important to socialize during the growth and a maturing puppy is because it builds confidence to any situation that may happen preventing the puppy to become fearful of people, dogs, sounds, etc. When you have puppy that is fearful it can lead to fear aggression which is one of the most leading causes of dog bites. Since I have been socializing Emery her confidence with people and other dogs have been fantastic. Since we have been socializing I have been bringing her with me into public places for practice. When I have her in public with me I have her stay at my heel and when I stop she has to do an automatic sit. She gets the opportunity to encounter people in motorized wheel chairs, shopping carts, and anything that is unusual to her day to day sights and gets her used to seeing these items so that she is not startled by them. When they pass by us I make sure I reward her for stopping and sitting to wait for them to pass by! I have found though that while it's great for her to be socialized with a service dog in training there is a time and a place! I have a lot of people in the stores that will stop and ask if they can pet her which is very difficult because I have to say no. But it's important for me to explain to them why they can't otherwise they just think your mean! So I am going to explain why (some) service dogs cannot be pet. When you see a service dog with a harness that says do not pet it's by no means because they are aggressive or that the handler just doesn't want their dog pet. It is because when you have a service dog they are working at the time they have a purpose and when people come up to pet or talk to the animal and can be very distracting and can possibly keep the dog from doing what they are meant to do. So If you happen to see a service dog make sure you ask first if you can pet because sometimes you may be able to pet them! Also, if you have children it is beneficial to explain to them that that is a service dog and they working so they shouldn't go up and pet them. I had a young daughter and her dad come up to me and ask if they could pet her and sadly I had to decline because Emery was already distracted. But the dad explained to her daughter why she was in the store and that she was working and the little girl seemed very interested so they asked me questions about her and I was happy to answer them! It was really a breath of fresh air because I have adults that just walk up and pet without asking first! But as Emery and I practice she gets better and better each and every day. She loves to be with me and never leaves my side except when we are at home but I am never out of her sight! Today I am going share a video of when she was much younger when I working with her basic obedience. I am going to try to post more video's of her working as I can. But the main message of the day is Socialize your dog or puppy and if you every come upon a service dog make sure you ask about them first before you try and pet them and also educate your children about approaching strange dogs! Well that's it for today. Next blog I will be posting a video of Emery working in the store. So be sure to join in next time. Rosehall Shepherds has been given permission by CeCe's Kool K-9 to post to their websites.